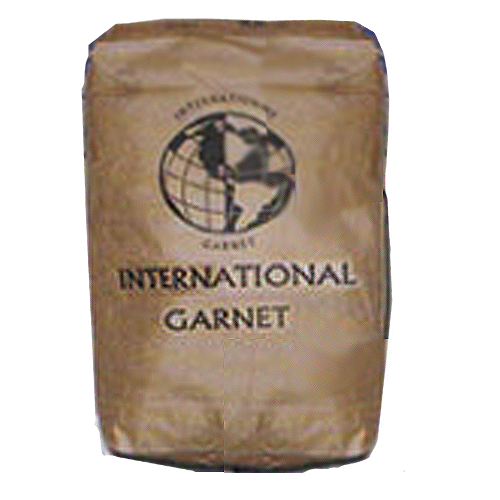 Called multi-media or mixed media filtration, the high density, small grain size of #30-40 Garnet solves a major filtration problem. In a single media granular filter such as a sand filter, the material will hydraulically classify during backwash according to granule size, the smallest rising to the top. When water flows downward through the sand, the fine particles at the top of the bed do most of the straining of the sediment. The solids form a cake on the surface with filtration typically taking place in the top few inches. As the cake forms, the filtration becomes finer and the head loss increases exponentially with time. The ideal situation would be to have the large grains of media at the top to trap the large solids, and a uniformly decreasing grain size in the direction of fluid flow with the small grains at the bottom to do the final polishing. The penetration of the solids into the entire bed allows for increased solids storage, longer filter runs, and higher filtration rates. A properly designed multi-media system will maintain its unique grading of large grains on top and small grains on the bottom and provide superior performance even after many backwashings. This stable condition of large grains above finer ones is achieved by the use of materials of different sizes and specific gravities. Garnet with its high specific gravity of 4.0 forms the lower fine grain layer, its 0.3 mm effective size can filter down to the 10-20 micron range. Filter Sand, (effective size of 0.5 mm) and Anthracite, (effective size of 0.9 mm), or Filter-Ag® can form the larger, less dense layers. Multi-media filtration technology is applicable to both water and waste water treatment. Custom designed filters with varying filter bed configurations can be designed to meet specific needs. For the majority of municipal and industrial water supply applications, a filter bed composed of 55% low density material, 30% medium density material, and 15% high density material is recommended. #8 Garnet at 140 lb/ ft3 is a good choice for support beds when using other high density filtration media such as high purity Corosex II or the new manganese dioxide oxidation medias such as Pyrolox.